Samantha Boyd, D.C.,P.A. (Hollywood) - Book Appointment Online! 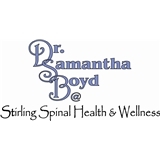 Dr. Samantha Boyd is a chiropractor in Cooper City, FL. Here you will receive chiropractic care in a state-of-the-art facility with a spa-like atmosphere that is both peaceful and serene. At our office you will receive exceptional healthcare while enjoying a comforting atmosphere filled with soothing music and the sound of waterfalls. Dr. Boyd’s mission is to provide her patients with holistic healthcare that is 100% natural, non-invasive, and based on many years of experience and training. We provide many services at our office which include chiropractic care, massage therapy, and a variety of vitamins and supplements. We look forward to caring for you and your family! She is very pleasant and unbelievably knowledgeable. Best chiropractic treatment I have ever had and affordable as well!